Get Your Door Locks Installed & Replaced In LA Today! Door locks are very important for the security of our house. 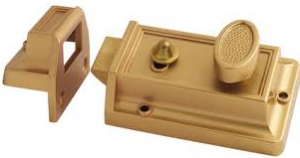 There are different types of home door locks that are available in Los Angeles Locksmith Pros. It comes in various styles and shapes in order to suit the wide range of security requirements and door materials. 1. Mortise Locks: It is a kind of lock that is been fitted into the edge of a door. In this kind of lock, only the forend are visible. These are been fitted into a pocket that is been cut into the edge that is known as mortise. These are available in sash lock and deadlock variants. Both of these use deadbolt in order to lock and the sash locks even have a latch bolt that holds the door in the closed position. The latch bolt is been operated by knobs or pair of lever handles on the sides of the door. 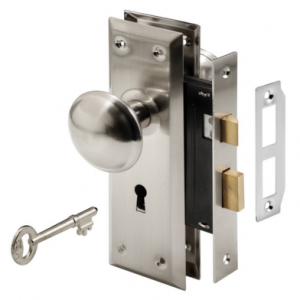 The popular types of mortise locks have horizontal locks with latch bolts and deadbolts. It has a much deeper case size that allows the knob and keyhole to turn horizontal to each other. These are often found on doors of the older style. The standard mortise locks are ineffective when it is been fitted into a sliding door. 2. Rim Locks: These are the kind of locks that are been fitted to the side of the door. These kinds of locks were the first kinds of locks that were invented and these are available in various shapes, styles, security levels and colors. 3. Night-Latch Locks: These kinds of locks use large latch bolt in order to lock the door. The bolt is been engaged automatically with the lock keeps. These kinds of locks are available in various styles in order to suit security and door requirements. A simple kind of night latch locks is the most basic kind of night latch locks. When the door is shut, the bolt engages with the lock keep and then the lock is been operated by a knob from inside or key from outside in order to release the bolt and to open the door. A snib is been located on the case of the lock that is been used to deadlock the bolt in both locked as well as unlocked position. 4. Deadlocking Night Latches: These kinds of locks operate in a similar method like that of night-latch locks but has an additional deadlocking feature that locks the gate through a key from outside. It allows the door to be locked while being away from the premises. 5. Auto Deadlocking Night Latches: These kinds of door locks offer a third locking option. It has an extra deadlocking pin that is been located just below or above the main bolt. When the door is shut then this deadlocking pin is depressed into the lock case that automatically deadlocks the bolt. 6. Night Latch Deadbolts: These types of home door locks use a solid bolt in order to lock a door. These types of locks are withdrawn by a handle from inside or a key from outside. Some of these kinds also have a latching system that holds the deadbolt in a withdrawn position until the door is been closed again. 7. Night Latch Roller-Bolts: These kinds of locks use a spring-loaded deadbolt that has a roller on the leading edge of the bolt that allows a door to be held in a closed position without locking it. The door can be opened with a simple pull or push. These kinds of locks are found commonly on the private flat entrance doors that allow the resident to walk out of their flat without the risk of locking them out or the door closing. 8. 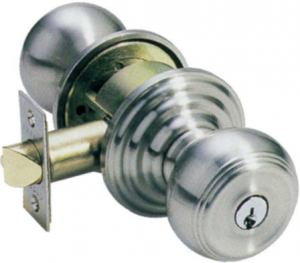 Knob Locks: These kinds of locks are the most common kind of locks that are been used on all types of home doors. These kinds of locks have knobs on both the sides. One side of it has a lock and the other one has a keyhole that unlocks the door. 9. Lever-handled Locks: These kinds of locks are found commonly on the interior doors. These are easier to access for those people who are handicapped. Most of these do not require keys. The locking of the door involves twisting or pushing of a button on the inside face.